Clean Ocean Access (COA) is a local environmental group in Newport County, Rhode Island with a mission of taking action today so that future generations can continue to enjoy ocean activities. We started in the summer of 2006 as a group of surfers who decided it was time to secure and protect public access at local surf spots, and were keenly aware of water quality issues at area beaches. The effort is now a coastal-inspired organization that is all about cultivating friendships within the community with a unified desire of working together to take good care of the environment and living healthy lives. Clean Ocean Access is hosting the inaugural Narragansett Bay Shore Wide Cleanup in Newport and Jamestown, RI on May 24, during The Atlantic Cup presented by 11th Hour Racing. Our approach since the group’s inception is that our success hinges on the active involvement of the community. We believe that what is critical for environmental sustainability is for people to spend time outside together, connecting with nature and understanding the impact we are having on the environment. We can make better decisions when we connect with nature. 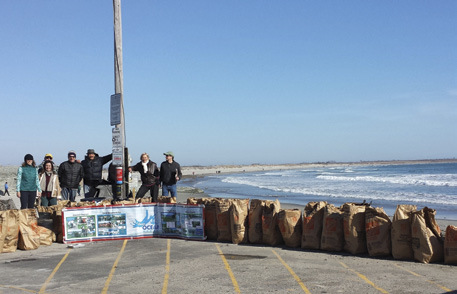 Within our CLEAN program, which focuses on improving ocean health by removing marine debris from the shoreline, we’ve conducted 85 beach cleanups and removed over 50,000 pounds of trash with a volunteer effort of over 6,000 hours. Our OCEAN program brought awareness to water quality issues during the cooler months and this realization led to significant work efforts by local municipalities to address bacteria issues with improving results so far. Our ACCESS program works to protect the coastline and maintain public access forever. We recently led the successful campaign to ensure the repairs to Newport’s Cliff Walk after Hurricane Sandy were done in such a way to protect the marine habitat and coastal features while making sure it is safe and accessible. We continue to clean the shorelines with over 25 events per year and have a goal of covering all of Aquidneck Island by 2016. Our OCEAN program monitors water quality at nine locations every week (all year long! ), working towards permanent year-round clean water. It has expanded to include a seaweed nutrient analysis program (SNAP). SNAP is exploring the ecosystem and ever-prominent macro-algae and whether we can mitigate this potential over-growth and improve the overall quality of our beaches and everyone’s beach experience. Our ACCESS program has expanded to include seven public rights of way, and we’re looking to adopt seven more this year. We want to ensure that shoreline habitat is available for public use and protected forever, and we’re strategizing towards marine protection areas for the East Coast this decade. Our ultimate goal is to change human behavior and eliminate trash on the shoreline and in the ocean. Later this month, on May 24 from 9 am to 12 pm, we are hosting the first ever Narragansett Bay Shore Wide Cleanup during The Atlantic Cup presented by 11th Hour Racing. Local organizations (Save the Bay, Aquidneck Land Trust, Green Drinks, Packaging 2.0, Clean Bays and others) and local businesses will take action by removing marine debris from the shoreline of Newport and Jamestown. The goal is to cover the entire coastline from Beavertail Point to the Pell Bridge in Jamestown, and from Brenton Point to Fort Adams State Park in Newport. Some parts of the coastline are rocky and inaccessible, but we are going to try! Teams will meet at various locations and cover nearly 18 miles of coastline. Following the cleanup, portions of the debris will be displayed at Fort Adams during The Atlantic Cup’s Inshore Series (May 24 & May 25 from 11 am to 3 pm), allowing spectators and residents to see what is along our shores. There are various cleanup locations along the shoreline. For more details and contact information, please visit our website at cleanoceanaccess.org/atlantic-cup-shorewide- cleanup/. This is an important step in working together towards living healthy lives and overall economic security for our Ocean State. Everyone is welcome to get involved. The best way you can help Clean Ocean Access is to think about how much you enjoy and depend on a healthy environment, and make a commitment to get involved so that future generations can continue to enjoy ocean activities. Sure, we could use donations to pay for our programs, but what matters most is that you start doing something good in your community today, meet like-minded folks, and start a wave of change. Dave McLaughlin is the Co-Founder and Executive Director of Clean Ocean Access. An avid wave rider since 1983, he resides in Newport, Rhode Island.